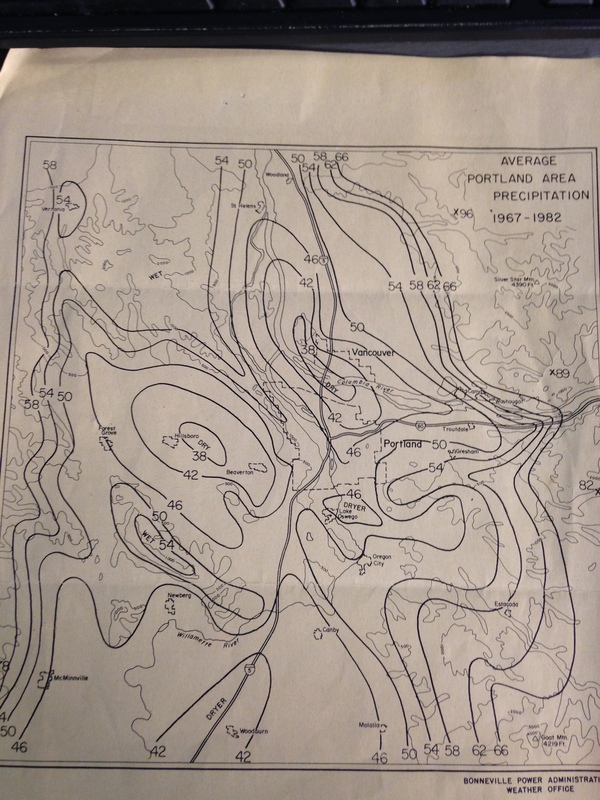 I was cleaning out a file tonight here at work (slow Sunday), and found this old BPA rain map I’ve had for at least 20 years. I think it is from Charlie Feris, who worked at the BPA for a long time. He (and maybe someone else) had a collection of rainfall observers around our area. Note it’s a 15 year period from the late 1960s to early 1980s. Rainfall distribution in our area is totally dependent on local topography. Much of the year air flow is from a westerly direction. Where air rises over hills or runs into mountains, rainfall increases as clouds dump their load of moisture. And the effect begins before the land begins rising too as clouds pile up ahead of the increasing elevation. When air descends off hills/mountains, rainfall accumulation is lower. Those of you that have lived here a long time know much of this, but it might be new info to some of you. Take a look at the map and then I have a few thoughts below. Feel free to add your own comments of course. The driest parts of the metro area are in the lowest elevations in the Tualatin Valley and along the Columbia River from Vancouver Lake to NE Portland. That includes the Hillsboro, Portland, and Vancouver airports. These areas typically average less than 38″ of rain each year. Another dry spot, although not quite as dry, is the northern Willamette Valley south of Wilsonville. No surprise, but the wettest locations are the eastern suburbs which are nestled up against the Cascade foothills and highland areas in eastern Clackamas/Multnomah/Clark counties. Those locations receive 50″ or more. That includes much of Gresham, Boring, Damascus, Battle Ground, Camas, & Washougal. I see Oregon City and West Linn get enough lifting from terrain in those areas to push the average to 50″ as well. Some of our far eastern towns/cities get even more. Looks like Estacada, Sandy, and eastern Washougal area gets 60″ or more most years! That’s an extra 22″ over PDX. Chehalem Mountain (between Newberg & Hillsboro/Sherwood) is a sharp rise from showers/rain coming in from the southwest, so that area gets 54″ or so. So do the Tualatin Mtns (West Hills), although to a lesser extent. Still, it’s amazing that the West Hills up around Germantown Road averages 50″ yet just a few miles northeast along the Columbia River it’s more like 38″. There is a bit of an increase on the far west side of the metro area near the Coast Range, but even Forest Grove and Banks average under 50″. That’s because most of the time the flow is from the south/southwest or west, so rarely do we see much “upslope” component to enhance rain there. It does happen; I have seen situations with a southeast low-level flow where those areas get far more rain than the east side of the metro area. I can tell you from living around the 62-66″ location…it sure does rain a lot more in the hills. 11 years ago I moved, but only about 2 miles as the crow flies farther east in the Corbett area. It’s noticeably wetter in the “new location”. This entry was posted on Sunday, September 6th, 2015 at 7:38 pm and is filed under Weather. You can follow any responses to this entry through the RSS 2.0 feed. Both comments and pings are currently closed. 72 for a high here today. Felt positively summery after the past 10 days or so (and in a normal year, low-mid 70s are typical for summer high temperatures here). Weather.com has 81 for me on Friday. Will my prediction last week of no more 80s for me this year hold or not? Wow, a high of 90 after an overnight freeze in Lakeview. 86 at 4:30 PM. NWS forecast for SLE has partly sunny chance of showers for Tuesday and Wednesday with highs both days of 76. Slight chance is less than 20%. KPTV has for PDX mostly cloudy and showery with highs of 65. Either PDX is going to be considerably cooler the SLE or somebody is going to have a busted forecast. Did you make this forecast Mark or someone else and why such a wide spread in temps and conditions. Usually you and the NWS are much closer together? Maybe it’s time to give Salem their own 7 day forecast since it seems our weather is quite often dissimilar to yours. Peace. I also subscribe to that motion. It’s looking rather active in the long rang models but given a strong El nino how active can it really be but will take whatever we can get now knowing were not gonna have a winter this year, then boom 2016/17 a strong La nina hits hopefully were make up for lost times. Speak to Mark or KPTV I’m up for it. Peace. 79 at 2:00 PM. Should hit 86 today even with the low clouds. Early today even with the clouds it just felt like it was going to be a warm day. Now sunny and breezy. The clouds cleared out by 10;15 AM. If we hit 90 or better on Friday and Saturday as expected it will be only the 4th time it has happened in Salem since 1892. 35 in 2014, 34 in 1958, and 31 in 1967. Saturday should be number 30. Our all time number of days over 80 is 94 set in 2014. Sunday should be number 92, tying 1967 for 2nd place. As for days over 70 Sunday should be day 133. The record is 154 first set in 1992 and tied in 2014. This is a short list of what has followed in the Winters following our hotter Summers over the last 60 years. 58-59-1 snowstorm lasting 3 days. 61-62 2 Arctic blasts and a fair amount of snow. 66-67-no snow and very mild Winter. 67-68-1 major snow storm. 70-71-3 cold snaps and 2 snowstorms. 74-75-Average Winter with a couple of minor snowfalls. 79-80-Cold early Autumn, then more cold with snow in January and early February. 87-88-mild Autumn then cold and snowy December and early January with big January windstorm. 90-91-cold mid December to early January with some snow. 92-93- cold with multiple snow events. 94-95-average winter with 2 snow events. 03-04-big cold and snow events late December and early January. 04-05-mild no snow. 06-07-average with 1 minor snow event in January. 09-10-Arctic outbreak with no snow in early December then minor snow event in late December. 12-13-beginning of RRR no snow except minor snow event March 22nd. 13-14-2 Arctic blasts with 2 major snowstorms. one in early December and one in early February. 14-15-The year without a Winter. 15-16-??? stay tuned. 70 days over 80 in a Summer constitutes a hot Summer for this purpose. So some years were mild and some were cold. We shall see what kind of Winter this will be starting in about 2 months, peace. So, here’s a visual breakdown of what you just posted. By your figures, it would seem that the overwhelming majority of your defined “hot summers” lead to cold and snowy winters. I don’t necessarily buy that, especially not this year. If I had to venture a guess, I’d say we’re probably in for another non-winter, with elevated chances of a significant ZR event mid January. No snow. That’s for PDX Metro. Eric I never said what would happen only what has happened in the past. What is it that those financial adverts always say? “Past performance is no guarantee future results.” I define a hot Summer in Salem as one where we have had at least 70 days over 80 in a Summer. For you in Portland it might be 60. Since we usually get more down here in the central valley. This is what happened in the past 60 years. Will it happen again this year. I don’t know. This wasn’t a prediction. You need to pay more attention grasshopper. I find it fascinating that some of you take me to task for predicting something when there was no prediction! My last line was “we shall see what kind of Winter this will be starting in about 2 months” Does that sound like a forecast to you Eric? As for your guess at this time it’s probably no better or no worse than anybody’s. Chill out dude. Peace. All I’ll say is that the March 2012 snowstorm was fairly major for the valley from about Salem southward. Around a foot in the higher hills of the valley during that event. It’s true that it warmed up quickly after that, but that’s what happens in the end of March. Who ever would have thought that we would have so much snow in the 3rd week of March…. That was a very exciting storm to live through….. The trend beginning in ’05 seems to be less low level snow following hot summers. And I would venture to guess the mountain snowfall would follow the trend as well. This being a big El Nino, I think the odds put us at close to zero and the mountains are gonna hurt again. Not good…..hope I’m really wrong. Dude, I’m not the one that needs to chill. I wasn’t challenging you in any way, merely pointing out that all but three of those winters you mentioned ended up with snow — frequently a lot of snow — and the overwhelming majority had below average temperatures throughout. I then ventured my own guess at what this upcoming winter may hold, but I never said, or even implied that you had done so. Maybe you need to take a step back and stop reading so much into what other people say, you’re really good at taking things out of context and getting needlessly defensive. The remnants of Tropical Storm Ignacio were supposed to move through here this morning. If they have, I didn’t notice anything. Just some early morning clouds and calm winds. I thought Ignacio was forecast to come ashore well north of you, somewhere along the central BC coast. Yes, you’re probably right. In any case, there wasn’t much left of it. Not more 90+ days! Go away! You’re not welcome here. Do not come back ever again. Looking at some models and I’m getting this amazing feeling that summer will be over after this hot spell and more comfortable weather will be the rule until winter. Then comes the fog. I’ve been keeping an eye on the extended forecasts at weather.com for a week or so and that’s basically what they’ve all said in one theme or another. The duration and intensity of the coming warm/hot spell has varied but they’ve all showed it warming up then cooling down into a more fall-like temperature range (with some shower chances but no big rainy spells) again. Hey Mat there are warm weather and cold weather nuts, we just don’t fit into their shell. When Oregon is a desert and there is no water maybe they’ll understand. Today was b-e-a-utiful but I’d much rather be skiing or sitting in front of a raging fire during a blizzard inside my cabin. According to Mark after Saturday our heat spell come to end. I predict that’s it for summer after this week. Hellooooo Falll!!!!!!!!!! 80 at 2:00 PM.First 80 degree day since August 28th. Day number 87 for the Summer. This current warm spell is just the frosting on the cake that was our hottest Summer ever. As for next Winter the OMSI winter weather weather conference will be on Saturday October 24th at 10:00 AM. They are still looking for presenters. I imagine Mark will be there to summarize last Winter. So be there or be….well not in attendance I guess. Summer is baaack, at least for a while. Yeaaaa. Peace. Funny how you really only regularly post when the weather is warm. This last cool spell u posted irregularly. To each his own I guess. Cant wait for fall and winter. We need rain and snow in mountains like a fat kid needs cake. Maybe once all the salmon are dead you’ll start rooting for rain and cooler weather. I’m not looking for an argument, just stating facts. You are a living breathing warm bias….peace. Is it really such a big deal to you that you take time out of your day to type 8 sentences just to point something out that is completely irrelevant to this blog and will most likely start an argument? I just don’t get it Mat. Mat you are looking for an argument. You don’t know the facts, you just want to stir things up. I post in all kinds of weather. You just see what you want to see. You said the same thing on another post and after I had just posted. But hey I can always use a good laugh. You know what Confucius said about a wise man speaks because he has something to say. Well I guess you just have to say something. Peace. Mother nature’s saving her warmest summer for another year. A year that includes September. October, and maybe even May. Can we imagine? Well, I can dream…Until that happens, happy false fall, and welcome back summer! I notice that the effects of W7ENK’s famous anti-weather dome are visible on the map, nice area of lower precipitation labeled “dryer”. David, occasionally the Olympic mountains have a rainshadow effect on us here in Vancouver BC as well. That Aug.29th storm, for example. Once those strong southerly winds developed, I noticed clearing from the south and the rain stopped. My location averages a little over 75″ a year. Hasn’t been as noticeable the past two years though. The calendar year 2012 had 103″ of rain here. Today on Mt Hood I found a well preserved Schlitz steel beer can. Quite a nice find for the collection. The ice and snow helped the can stay in great condition as everything is still readable. I thought it went well with Mark’s blog tittle. I just asked because that’s the most important part to me. Date 1949 on can. Resting in the Eliot Glacier 66 years until today. Uh oh. The seven day has a couple of you-know-whats in it! Bye bye freshly fallen snow on Mt.Hood. Speaking of rainfall. Facebook memories today reminded me that it was 5 years ago today that the most intense hourly rainfall recorded at PDX occurred. During that event it never rained in most of Clark County that evening. Above the Eliot Glacier on Hood enjoying the fresh snow with occasional rumbles beneath the glacier. Pretty amazing place. The lower 1/4-1/2 mile is rock covered over the glacier, pretty deceiving. Sure has receded a long way this year. A great spot for Labor Day with fresh snow on top of all Cascade Peaks. I worked farming for many years in the Aurora area and lived down below Boring on the Clackamas River. I sure noticed a big difference in rainfall amounts between the two areas, probably at least 12 inches more at home than on the farm near Aurora. wow that map is really OLD. I have lots of more data that I could use to update it. But I think that the patterns would be pretty much the same, except for the underlying base, ie, I could add I-205 and revise the Portland city limits to their present location. Thanks Charlie. I agree that the totals would probably still be within 5″ of the numbers from a generation back in time! Makes sense with what I observe at my house – I’m just west of the Hillsboro Airport, and there are times when I’m completely dry and others are getting a downpour only a mile away. It was Charlie and Bill Wantz both BPA meteorologists, I shared my observations for Hazel Dell for many years. They concluded that the “average” most representative rainfall for the metro area would be Lake Oswego. Thaat is seen in a little anomaly of increased rainfall just up a ravine (Chicken Creek) from Vancouver Lake. The Chicken Creek observation was mine, got the sentence out of sync. Meant to follow the Hazel Dell wording. I love Charlie’s rainfall maps! I also find it interesting that there is no I-205. Down to 54 now, going to be another cool night! Clear now and 70. Went outside an hour or so and it felt much warmer this evening compared to last night. It feels like Summer is about to make a big comeback. I’m just not ready to give up on Summer yet. So here is a summary of the recent cool spell in Salem. It lasted 9 days. 3 days longer than I expected. We has .64 inches of rain. All falling on August 29th and 30th. No rain so far in September. The coolest day was Friday at 68. The warmest day was Wednesday at 78. The peak wind gust was 39MPH. I expected .25 unless we had a TRW in which case I felt we could have as much as .50. We had .64. In 1985 we had a very hot Summer. Then around Labor Day it turned cooler and wetter for about two weeks. Then a brief return to Summer before slipping into an early Autumn. Salem dropped to 25 around the 10th of October. November and December were record cold. Thanksgiving had snow and highs in the 20,s. After that is was a much milder Winter reaching the low 70,s in early February of 1986. Could this Winter be a repeat? Probably not but we shall see. Peace. I’m thinking it won’t be similar to winter 1985-86 for the simple reason that it wasn’t an El nino winter. (1986-87 was). 58-59 had a 3 day snowstorm in early January. 87-88 had a month of cool to cold weather and some snow from December 10th to January 10th and a big windstorm on January 10th. Last year had well nothing at all. Thanks for the info Mark. Peace. Winter 1987-88 was okay here, with a few cold spells and a little bit of snow, I don’t know anything about 58-59, and 2014-15 was just too mild. So if our next winter goes like 1987-88, that’s a pretty good improvement over last winter. I noticed that, too. Hahaha!